Snare - 3x13" Wood Snare Drum. Stand - Combination Stand. Practice Pad - Tunable Practice Pad. Bells - 2.5 Oct. (F ' C) Aluminum Bells. Bag/Case - Durable Rolling Compartmentalized Bag. New Rolling Bag Design features durable rubber wheels, telescoping pull handle, stylish black & red padded nylon material with heavy duty zippers. 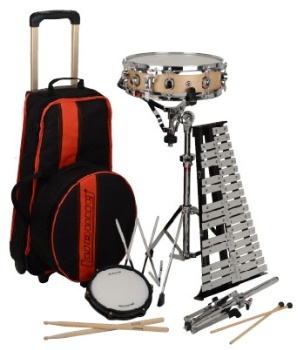 Accessories - Sticks, Mallets, Music Rack.